Is Your Toddler Climbing on Everything? It's adorable the first time your wobbly tot tries to pull herself up onto the couch. You might not be able to stop the smiles and giggles; maybe you even manage to videotape her struggle to conquer the Lay-Z-Boy so you can relive the cuteness. Skip ahead several weeks or a few short months, though, and the happy feeling might be gone as you watch your toddler trying to scale every piece of furniture or vertical structure in his path. Welcome to the world of parenting a climbing toddler, be it ever so frantic. 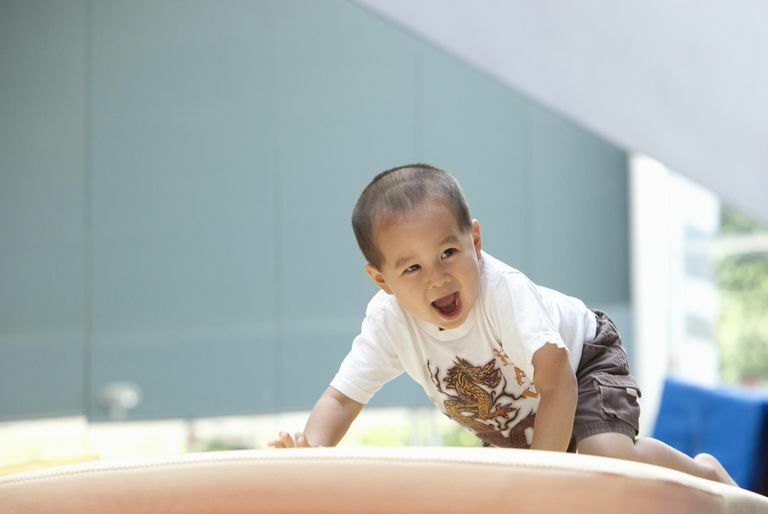 Climbing is an important stage in the development of gross motor skills, but it can be hard behavior for parents to manage. At the very least, it may seem inappropriate and a bit irritating. It can also lead to the ruin of many a couch cushion or bookcase. The greatest concern for most parents, though, is safety. Your child is going to fall. She could get scraped and bumped and may suffer some more serious injuries. In light of the very real possibility of harm, you might want to put an end to the climbing. Trying to stop a climbing toddler is not likely to work, though. A better approach is to learn what motivates your child to climb, look for ways to redirect that urge and do whatever you can to lessen the risks of injury. They climb because they can (or at least can try to). Kids start to gain greater control over their body movements at around 18 months of age. They realize they can throw that ball, run fast across the park, and pull themselves up onto furniture. It's innocent at first: your toddler just wants to sit up on the couch like mommy and daddy. Once he finds the power in his body, though, your child may want to explore the boundaries just like he does with everything else. For some children, the inevitable knocks and an understandable fear of those high places are enough to keep them from pushing the limits too far. These kids will probably be easily discouraged from climbing by a few firm reminders and demonstrations that chairs are for sitting and bookcases are not steps. There is another personality type, though, that will not be stopped. For these toddlers and 2-year-olds, climbing is a thrill. They both want to flex their muscles and satisfy their curiosity about what's up there on the top shelf. Toddlers with older siblings may be even more determined climbers because they are trying to imitate the kids around them. How Do You Stop a Climber? Short of removing from your home every vertical object as well as objects that could be stacked vertically, you can't really stop a climber. And really, you don't want to (at least not in the long run). Climbing is an excellent way for young children to build strength, flexibility, and balance. It is also a way for young children to learn about their environment and to gain confidence. Of course, even if you relax the no-climbing rule in your own home, there are places and times in which climbing just cannot be allowed. (The time my toddler tried to scale the church pew during services comes to mind.) In this case, you can try applying effective discipline techniques to stop the specific behavior, but try to avoid making it seem that all climbing is forbidden. If your reaction to any and all climbing is dramatic and loud, you might accidentally fall into one of the worst toddler behavior traps: turning that which is forbidden into a fun game that gets mommy's attention. While some children seem to be "climbers" by nature, it doesn't mean that your child will only be happy when he's scaling tall (and not-so-tall) structures. At the heart of the desire to climb is just that basic toddler desire to be active. You might be able to avoid the worry and chaos that comes with climbing if you can satisfy your toddler's urge to move with activities that keep her feet on the ground. The first thing you may have to do then is to accept that toddlers aren't made to stay still. Coming to terms with that fact can help you be more patient when faced with a rambunctious tyke. Next, you should give your child time and space to move. An hour or two in the yard or at the playground is excellent, and it may tire a toddler enough that he'll want to nap or rest for a while afterward, but once he's awake again, he'll be ready to go, go, go again. If you try to keep your child confined or provide toys that are just of the "sit-and-be-calm" variety it's very likely to backfire and push your active toddler to (literally) start climbing the walls. Moms who accept that their little ones have a need to run, jump, and even climb might be able to gain a bit of control over the situation by setting up safe-to-climb play spaces. Find a spot inside or outside where you can give your child some freedom to explore independently and fill that area with toys that encourage toddlers to be active as well as pillows, couch cushions, and soft materials that kids can stack up and climb on. Having a playmate around might also distract your child from climbing. even if the two only are in the parallel play stage, a pal may eliminate the need some climbers have to find something more thrilling to do. Of course all the accepting and distracting in the world won't stop you from jumping in fear every time you spot your toddler teetering off the edge of a window sill or hanging from the chandelier. Knowing, though, that you're not going to be able to stop the climbing, you might concentrate on creating a safe-as-possible environment for little ones who will (inevitably) fall. One area to pay special attention to is crib safety. It usually doesn't take too long for climbers to learn how to scale the crib's sides. Some parents might try to keep a toddler safe in a crib by using a crib tent. Others see it as a sign that it's time to transition a toddler to a bed. If you choose to keep your child in a crib, it might be best to make it as easy and safe as possible for a toddler to get out. Instead of taking the risk that your toddler will get hurt dropping out of the crib from a high point, you might place a secure piece of furniture close to the crib that your toddler can climb out onto and from which he can easily lower himself onto the floor. Experts recommend not using pillows around the crib to cushion a toddler's fall since these can easily move and leave your toddler vulnerable to potential injury. Placing a toddler-friendly step stool near bookshelves or by other areas that he can't reach (and where you don't mind him grabbing things off the shelf). Pack away trinkets, knickknacks and other items that are magnets for curious toddlers (it's temporary; you should be able to put them back out by the time your child hits preschool). Move furniture away from the windows and be sure that all windows are properly secured to prevent falls. One last thing to keep in mind is that climbing is one of those phases that toddlers will pass through. Any stress you feel now, remember that it will not be forever. Your toddler will outgrow the desire to climb on everything...just as she discovers something new that is likely to make you feel just as concerned.